The goal of the MCCS dress code is to encourage students to view school with an attitude of seriousness, as opposed to one of casualness. The manner in which people dress has an effect on their confidence and performance in all areas of life. At MCCS, we would like the manner of our students’ dress to reflect that God has made them uniquely male and female while at the same time allowing for individuality, and taking into account economic feasibility. The dress code below should be enforced by the parents and adhered to by the student. Please do not transfer the responsibility of dress code enforcement to the school. Students in violation of the dress code will not be admitted to class until parents have brought appropriate clothing to the school. The basic MCCS uniform consists of a white, navy or burgundy polo shirt (long or short sleeved) and khaki, navy, or black pants. Students may also wear black jeans. No acid wash or hole-y jeans will be allowed. Khaki, navy, or black walking shorts may also be worn as weather allows. Pants and shorts are to be properly fitted and in good condition, not over-sized or undersized. This often becomes a challenge in the spring, as children grow out of their start-of-the-year uniform pants. Shorts should be no higher than 6 inches above the knee. K - 5th grade girls may wear a navy or khaki jumper or knee-length skirt; 5th - 8th grade girls may wear a long or knee-length skirt. Girls may wear tasteful, modest, and clean shorts or leggings under dresses or skirts in navy, white, black or burgundy. 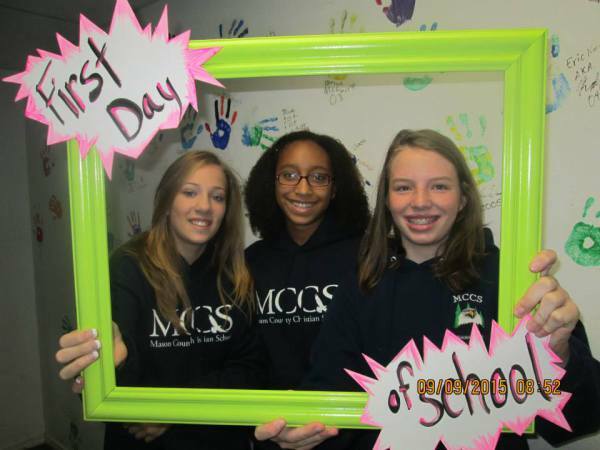 Students may wear MCCS sweatshirts in the classroom. ​Footwear must be worn at all times. Sandals with a heel strap are acceptable, “flipflops” are not. Tennis shoes with “wheels” are not allowed at school. Hair must be a natural occurring shade (say goodbye to those fun summer colors). Used uniform items are available for purchase from the school’s uniform room. You may also purchase MCCS logo crew sweatshirts, hoodies and P.E. shirts from the school office. P.E. Uniforms will be worn by students in fourth-ninth grades. Uniforms consist of predominately navy or black sweat pants or shorts, and red MCCS t-shirt. Grades fourth through 6th may wear their P.E. uniforms to school on Tuesday and Thursday. Seventh through ninth grades will change during their lunch break into their P.E. uniforms daily. Additional uniform information can be found in the Student Handbook.